Homeira Qaderi had been writing privately since her days as an adolescent in Afghanistan, but the formal education and perspective she gained in Iran gave her the confidence to allow her talent to flourish. Acting as a counterbalance to regional literature that ignores the lives of women living under Taliban rule, Qaderi writes mostly fiction inspired by her own experience and by the lives of women she has known. Photo by Tim Schoon. Homeira Qaderi was 13 when she was taken out of school and told she could never return. The Taliban had assumed political control of her home country of Afghanistan and implemented a strict interpretation of Sharia Law. For women—even girls as young as Qaderi—that meant the loss of many freedoms. It became illegal for women to walk in public without a male family member, ride on mixed-gender buses, or receive an education. When Qaderi was just 15 and living in the city of Herat, she began to organize classes for the younger local children. With libraries shut down and most textbooks seized by the Taliban, Qaderi taught the children how to read, write, and do basic math. Homeira Qaderi will be among a number writers who will discuss the expected or unexpected role of writers within society as catalysts for positive social change—and whether or not they feel pressured to fulfill this role. Other UI IWP participants include El Jones (poet, Canada), Michael Mendis (fiction writer, Sri Lanka), Nael Eltoukhy (fiction writer and translator, Egypt), and Marie Silkeberg (poet, translator, nonfiction writer and filmmaker, Sweden). But Qaderi also planned on furthering her own education. After she pleaded with her father, a high school Persian literature teacher, he agreed to help her, knowing the consequences could be fatal for both of them if they were caught. After work each day, he took his daughter to underground classes where an amateur lecturer helped Qaderi advance her literary skills. However, above ground, life became a daily struggle for Qaderi to hold onto the basic rights she had enjoyed as a young girl. At 17, her life changed again. Qaderi was wed in an arranged marriage—a practice common in Afghanistan. She then applied to and was accepted by the University of Tehran in Iran. She was beginning life in a new country with a new husband and was optimistic about rediscovering the freedoms she had lost to the Taliban. While studying in Iran for the next 12 years, Qaderi found something else: her voice. Today, Qaderi is in Iowa City as a participant in the University of Iowa’s International Writing Program (IWP). She received a Ph.D. in Persian literature from Jawaharlal Nehru University in New Delhi, India; she teaches at the University of Kabul and serves as senior adviser to the Afghan minister of labor, social affairs, martyrs, and disabled. She is also the author of six books, including a collection of short stories and her widely acclaimed novel, Silver Kabul River Girl. While at UI, Qaderi has been working on a collection of letters detailing the events of her life. These letters are addressed to her 2-year-old son, who is being cared for back in Afghanistan. In its storied 48-year history, the University of Iowa’s IWP has brought more than 1,400 writers from more than 130 countries to Iowa City. The two-month program brings together emerging authors and accomplished writers who help them refine their current projects and expose them to American culture and literature. IWP writers also have the opportunity to contribute to and learn from UI literature courses. While at the University of Iowa, Qaderi has been working on a collection of letters detailing the events of her life. These letters are addressed to her 2-year-old son, who is being cared for back in Afghanistan. “They will explain my life and the change I have been fighting for these past 20 years,” she says. “It is literature, but is also for him personally for when he gets older.” Photo by Tim Schoon. 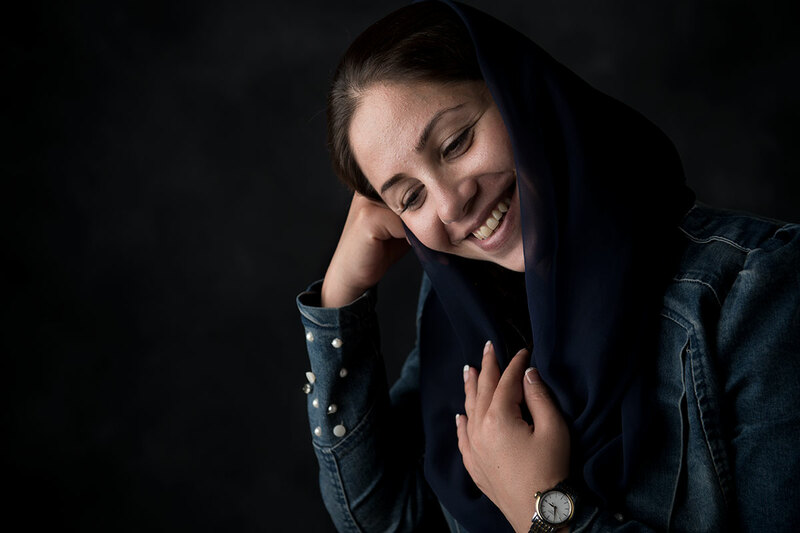 Qaderi had been writing privately since her days as an adolescent in Afghanistan, but the formal education and perspective she gained in Iran gave her the confidence to allow her talent to flourish. Acting as a counterbalance to regional literature that ignored the lives of women living under Taliban rule, Qaderi wrote mostly fiction that was inspired by her own experience and the lives of women she had known. Her efforts were rewarded as her works were published and garnered critical acclaim from the literary community. But Qaderi’s path hasn’t been easy. While pursuing her Ph.D. at the University of Tehran, some of Qaderi’s published works began receiving attention from the Taliban. Though she had felt emboldened by their receding influence, writing literature critical of the Taliban would prove to be a costly decision. The Taliban’s connections in Iran had Qaderi expelled from the country, and she was unable to complete her degree in Persian literature there. Her return to Afghanistan spurred death threats—which she receives to this day—sent to intimidate and silence her. Some of Qaderi’s relationships with family and friends strained under the pressure of negative attention, and her name was publicized in some circles as a corrupting influence on the country. Still, Qaderi remained steadfast in her cause to improve the lives of women under Taliban rule. It is for her efforts over the past 20 years that Qaderi is seen by many as a champion of women’s and human rights. “I can’t afford to be silent,” she says.